Graduation Thank You Messages : Achieving graduation is the most precious dream to become real in a person’s life. This even holds potential importance in his/her life. But this is not your own alone journey to make. In this academic career path, you take along with you your father, mother, friends, teachers and mentors. All of them have an equal contribution to your success. You must be thinking about how to express that gratitude to them in a standard way? 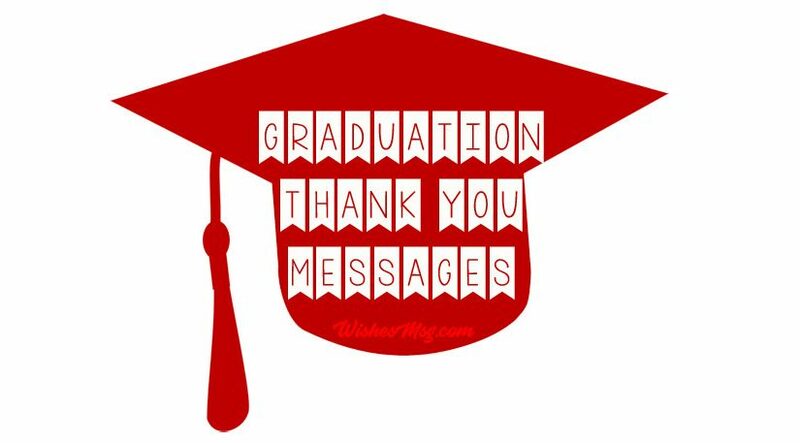 This is why have compiled here graduation thank you messages to parents, teachers, friends to show them thankfulness for their efforts and supports. Mom and Dad, you both are the priceless blessing in my life. I wouldn’t where today I am without your inspiration and support. Thank you for all your guidance! You are the place where I found peace of mind and zest and inspiration for life. Thank you, Mom and Dad, for being there always to drive and support me! 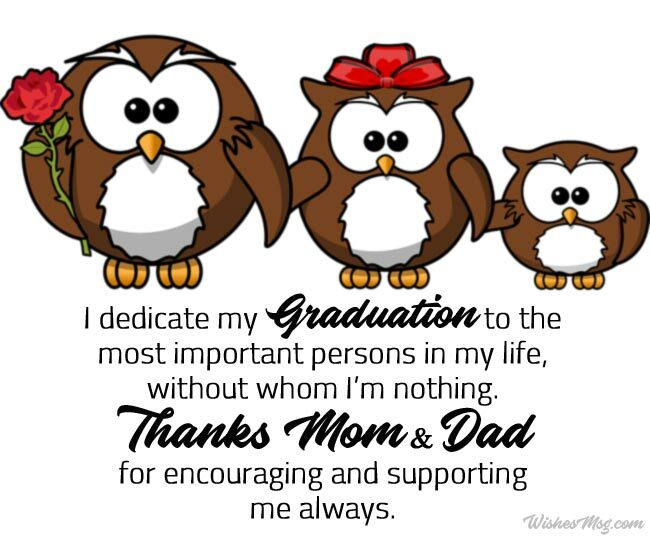 I dedicate my graduation to the most important persons in my life, without whom I’m nothing. Thanks, Mom and Dad for encouraging and supporting me always. Mom and Dad, you’re the inspiration behind my success. I just want to let you know how much you both mean to me. Love you and thanks for everything! You’re my true friend, philosopher, guide, mentor, and the whole world. Thank you so much, Mom and Dad, for all your efforts and love for me. You’re the best! Dear Sir/Madam, today’s achievement is the result of your contribution. Thanks for guiding and inspiring me. Without your guidance, I wouldn’t have been reached here. Thank you, Teacher, for all that you did for me. You’ve bestowed me with motivational thoughts and real-life inspirations that’ll always help me to shine in ahead. 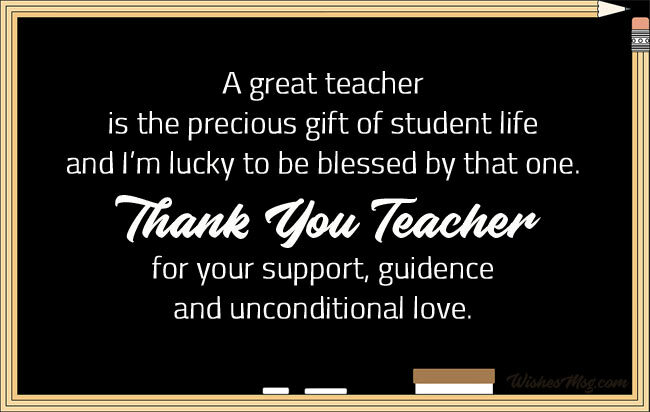 A great teacher is the precious gift of student life and I’m lucky to be blessed by that one. Thank you Sir/Madam for your unconditional love and affection! Sending you my sincere gratefulness to you. You’re the best teacher ever in my academic career. Thank you for guiding me to make my tomorrow brighter! I’m indebted to you for your sincere guidance and belief in me that I can make it. Thank you for being such a nice person and a wonderful teacher! Thanks to all of my friends who were always stand by my side with their sincere supports. I’m grateful to have such helpful friends through my journey. Whatever I’ve achieved today, it’s culminated with the help of my friends and mentors. Thanks to them for being understanding and helpful in this tough period. My amigos, I can’t thank enough you guys for supporting, helping and being there whenever I need you through my academic career! Really you all are true pals. Dear friends, without your presence my graduation wouldn’t be completed. Thanks a lot for all the encouragements and help. You’re really special to me. Friends, you’re precious blessings of my life and I’m so lucky to have such great friends. Thank you for your concern and being there always for me. Although your presence means a lot to me, let me know my sincere gratitude for your wonderful gift! Words can barely describe the magic of achieving graduation. Thanks a lot for making the day more special by sending your thoughtful gift. Your valuable thoughts always holds a significant place in my heart. And thank you for the beautiful gift on my graduation. It is so adorable of you to share this joyous celebration of my graduation with me. Thank you so much for your thoughtful gift! Thank you for your lavish gift. I can see that you’ve got a positive concern about me and must praise your choice for selecting that suits the occasion. The road to graduation was a long story of early mornings and sleepless nights that I’ve made up successfully. Thank you for joining in my graduation party. You’ve been always there to support me through my way to graduation and can’t thank enough for that. Sending you my deepest gratitude for joining my graduation event. Thanks for comforting me day after day and for being a part of my celebration of graduation. It is completely my pleasure to have a great person like you at my graduation party. Thank you for coming. 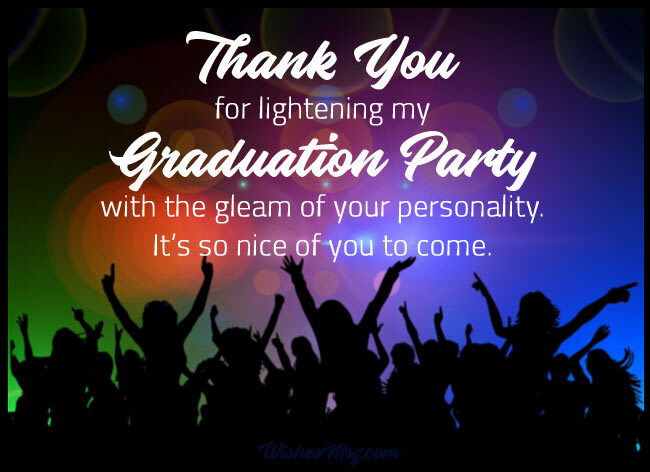 Thank you for lightening my graduation party with the gleam of your personality. It’s so nice of you to come. 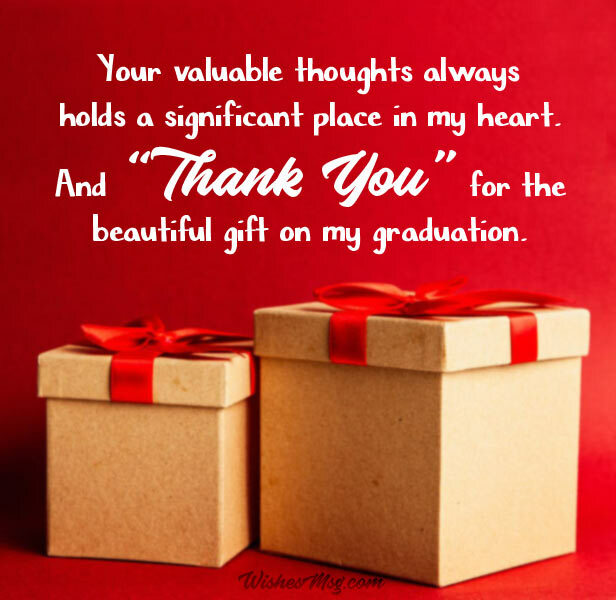 Graduation thank you messages are the best way to show your loved ones that you understand their feelings for you and hold gratitude towards them. 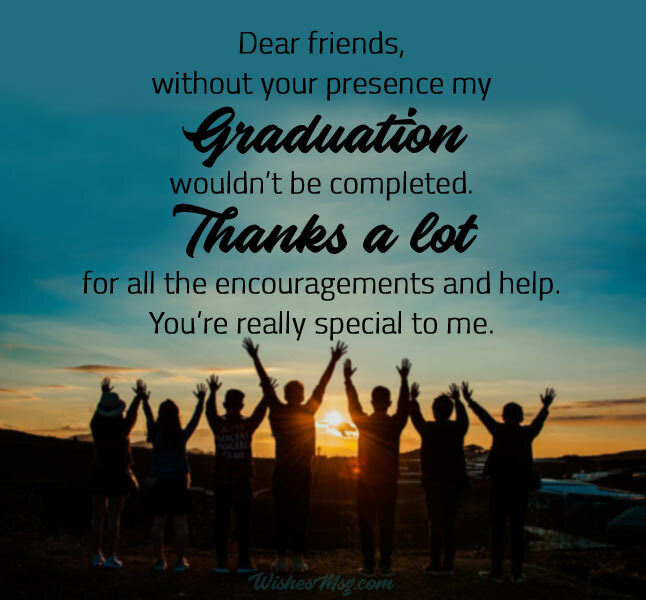 With the help of our above-mentioned graduation thank you messages, you would be able to express your emotion and gratefulness to your closed and loved ones who have supported and encouraged you through your graduation period.